Our products are all designed to be build at home in your garden. Everything is included, all you’ll need is basic tools. 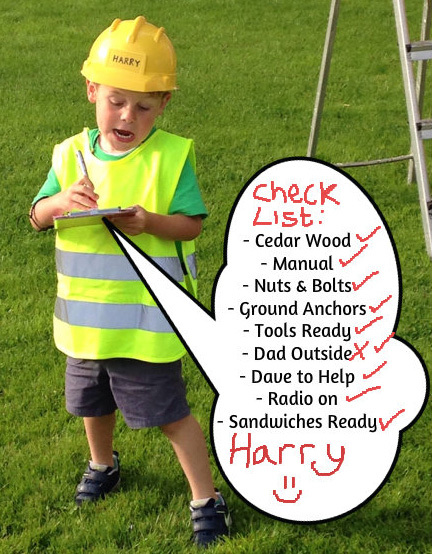 However, if you’re considering using a professional climbing frame installer we offer some advice below. Now you’ve chosen your climbing frame and arranged delivery, take a moment. Wow, you're getting a climbing frame! It's time for a building checklist. Have you got a clear area? Now check the area is level. Are your tools are ready? Before building begins you need to ensure that you have a large enough level space in your garden. Your garden plans should include a safety zone of 1.6m (6ft) around the playset. This is a recommendation from EU standards (EN71) at the time of writing Australia has not got an equal. This allows for children and adults to move around the playset safely, not obstructing swings or slides. For safety the area should also be level, this reduces the risk of swings getting close to each other when in use. Grass is a perfect surface for playsets as it provides adequate cushioning for falls from our play sets. Bonded rubber or artificial grass needs laying before building begins. Putting down loose fill materials after building is an easy effective option. Checking parts before you build is a top build tip. Using an installer or building yourself this will save a lot of time if something important is missing. We don't want people setting aside build time, then be missing a vital part. If your set arrives with missing/damaged parts then we will replace them – You can claim replacements by clicking here. We aim to dispatch replacement parts within 2-3 working days. 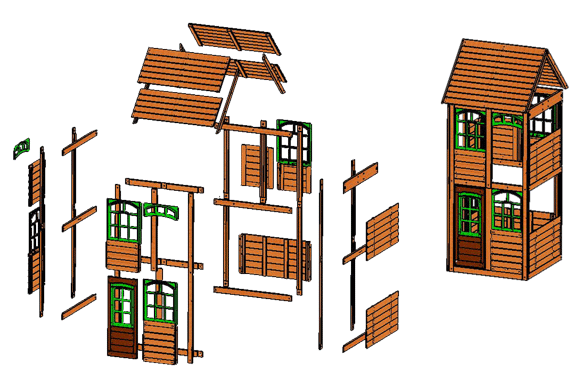 These playsets are easy home builds, but we understand some people will wish to use their gardener or handyman to do this job for them. Most reputable installers will not request money up-front. We recommend you only pay once the installer has completed the work expected of them. If an installer turns up and the garden isn't ready for building to start, parts are missing or damaged, they may not complete the build as planned. If this happens they may charge you a call out fee for a second visit. We will replace damaged or missing parts, but are not responsible if you have not made adequate preparations for them. We recommend going through all the checks above and have the garden and parts ready for building to begin. Reputable installers and tradesmen will offer a fixed price (or ‘job rate’) rather than an hourly rate. This guarantees the price you pay. Ask for the quote in writing to ensure there is no dispute at a later date.. Ask to see a valid insurance certificate for building play equipment, and ensure they have public liability insurance in case someone is hurt on site. A genuine tradesman with have an insurance certificate to prove this. Also, get references from your installer to check their past work. Once your climbing frame is assembled in your garden and your children then we hope you and your children will enjoy many happy years of use. As with any wooden garden product it’ll occasionally need maintenance to keep it in tip-top condition. We recommend you check the playset annually and throughout the play season to ensure that all bolts and screws are tight and secure, and all accessories of free from wear and safe to use. Our wood is pre-stained in the factory after we have cut and drilled the wood. This ensures your wooden climbing frame looks amazing and is protected for the initial months of usage. It is not a requirement of the warranty to re-stain your play equipment, however, as with any wooden garden product, whether it’s a playset, fence, shed, decking or table and chairs, we’d recommend you treat it with stain or sealant to ensure the effects of weathering are minimised.